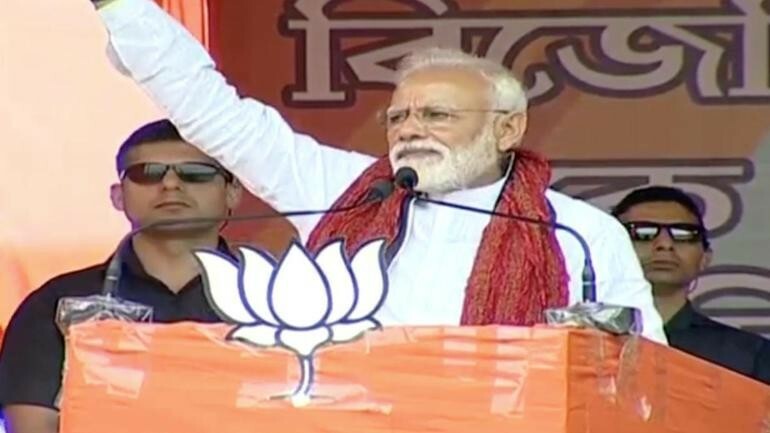 Prime Minister Narendra Modi launched a scathing attack against West Bengal Chief Minister Mamata Banerjee while addressing a public rally in West Bengal's Cooch Behar on Sunday, April 7. Stepping up the ante against West Bengal Chief Minister Mamata Banerjee, Prime Minister Narendra Modi said, "Didi is scared and frustrated". Addressing a public rally in Mamata Banerjee's home turf, PM Modi accused Banerjee of supporting anti-nationals. Modi said Banerjee is backing people who want two prime ministers in the country – one for Jammu and Kashmir and one for the rest of the nation. "Can you imagine this? Didi, your companions are openly claiming that India should have two Prime Ministers," Modi said. "Didi is backing anti-national people. You trusted her too much but she betrayed your trust," PM Modi told the crowd in West Bengal's Cooch Behar on Sunday, April 7. PM Modi slammed Banerjee for forging an opposition alliance with the likes of National Conference Vice-President Omar Abdullah, who recently advocated a separate premier for Jammu and Kashmir. "The people of the nation and Bengal should know that a son of this soil sacrificed his life for one leader, one nation, and one sign. His name is Shamya Prasad Mukherjee. Didi (Banerjee), you are sitting with them? Is it not an insult to the soil of Bengal, to the country's sacrifice and to the brave martyrs?" he asked. Accusing the Trinamool Congress supremo of joining hands with those who want the nation to be divided into many pieces, Modi said the Bengal Chief Minister does not care if their decisions create chaos and unrest in the country. "In a bid to oppose Modi, Didi is being friends with such people. She does not care if there is chaos and unrest in the country," he said. "Friends, you have relied a lot on Didi but she has demolished your faith. The nexus of aunt and nephew has rouged this great land with goons, infiltrators, human and animal traffickers and extortionists. Didi and his companions have put breaks on people's hopes and aspirations," Modi alleged. Taking a swipe at the West Bengal's ruling Trinamool Congress slogan of "Maa-Mati-Manush" (Mother-Motherland-People), Modi claimed that the current state government has insulted all three entities during its reign. "The truth behind the Maa-Mati-Manush government is something else. For the sake of her vote bank politics, Didi has joined hands with those who raise slogans to break India into many pieces. "By letting infiltrators in, she has also betrayed the land of Bengal and by advocating a rule of hooliganism in the state, she has destroyed all hopes of the people of West Bengal," he added.